Castlerock Golf Club in Northern Ireland hasn't changed much over the past century. Like all the best Irish links courses, Castlerock features enormous, hairy dunes and views of both the jutting spires of the nearby town and the gray-blue expanse of the sea. COLERAINE, Co. Londonderry, United Kingdom -- For many Americans, Northern Ireland might still conjure memories of The Troubles, a roughly 30-year period of ethno-nationalist violence exacerbated by religious and political strife between Protestants and Catholics. During that time, Northern Ireland's capital city, Belfast, was on nightly lock-down, and tourism withered. The Troubles basically ended in 1998, however, and in the intervening nearly 20 years Belfast has thrived. Block after city block of buildings that once stood derelict are now filled with trendy restaurants, posh hotels and teeming nightclubs. Even the city's oldest pubs -- some dating from the 1630s -- are once again hopping. If a major city going through a true renaissance can be considered a "hidden gem," Belfast is indeed such a gem. All of Northern Ireland, in fact, is blossoming under the warm sun of peace. Border crossings and military posts have been razed, and now motorways run unobstructed from Dublin to Belfast, and many other points south to north. This is all wonderful news for golfers looking to experience the full range of Irish links courses, both in the Republic of Ireland and in Northern Ireland. Indeed, Northern Ireland boasts some of the best links on the Emerald Isle. Along with well known tracks such as Royal County Down and Royal Portrush, there are plenty of lesser-known beauties, as unexpected and thrilling as the new clubs and eateries in Belfast's old warehouse district. 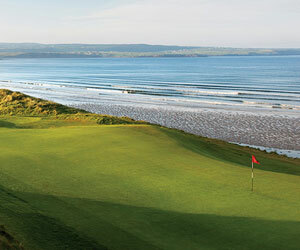 Take, for example, Castlerock Golf Club in Castlerock on the northern coast. The club, founded in 1901, is home to two courses, the original 18-hole, 6,805-yard, par-73 Mussenden Links and the 1970s-vintage, nine-hole Bann Course. This beautiful, coastal links can be played for 75 pounds sterling on weekdays (90 on weekends) or twice for just 90 pounds (110 on weekends). Or, if you can find a member to play with, this quintessential links can be experienced for just 15-20 pounds. The Castlerock links, laid out by Bernard "Ben" Sayers, hasn't changed much over the past century. Like all the best Irish links, Castlerock features some enormous, hairy dunes and views of both the jutting spires of the nearby town and the gray-blue expanse of the sea. Perhaps the best-known hole is the par-3 fourth, named "Leg O'Mutton." It's a 200-yard shot from the slightly elevated back tees, with railroad tracks tight on the right and a stream cutting diagonally across the fairway and alongside the raised green on the left. There's not much margin for error on the tee shot, but if you find the flat green, it's a birdie opportunity. According to PGA Professional Thomas Johnston, Castlerock is popular among locals because players can "pretty much see where you're going." Aside from the 375-yard second hole, the best bet is always to "play to where you can see." Leg O'Mutton not withstanding, the first six holes of Castlerock are not overly memorable. But then, at the 407-yard seventh hole -- dubbed "Armchair" -- it's like someone flipped a switch, and the holes just get better and better -- one stout links hole after another. In this way, Castlerock reminded me a bit of Ballybunion, another course with an underwhelming first five or six holes. Although Castlerock doesn't boast a collection of true seaside holes like Ballybunion, there are some idyllic views of Donegal, and on a clear day, you can see all the way to Scotland and the Isle of Islay. It's hard to pick a favorite hole from the final two-thirds of the Mussenden Links at Castlerock. The 214-yard ninth hole ("Quarry") is one of the stronger par 3s you'll find in Northern Ireland. And the 430-yard 12th, named "Spion Kop" (Spy Head) either refers to the enormous mound in the middle of the fairway or the view down the coast from the back of the green. The closing hole is short, at just 357 yards from the blue tees, but the tee shot plays with your eyes. Aim at the white and cream houses to the left, as the right is instant death, even though you cannot see this from the tee. Woolly dunes surround on all sides, calling to mind the golfer's version of a familiar psalm: "Yay, though I drive through the valley of lost balls, I shall fear no bogies." In short, Castlerock Golf Club is a prime candidate for the title of "Best Irish Links You've Never Heard Of." Play 36 holes on the Mussenden Course or nine on the Bann Course, then lunch in the snow-white clubhouse, and then 18 on the Mussenden -- any combination you choose will be richly rewarding. No matter how you score, you'll be singing, "Forget The Troubles, come on, get happy!" The renaissance city of Belfast is a reasonable home base for golf in Northern Ireland if you also crave some nightlife, but you'll need to factor in a fair bit of driving time. The massive two-year-old Titanic Belfast Museum in Belfast is worth at least half a day. The tragic history of the doomed behemoth really hits home as you stand in the dry dock in which the ship was built more than 100 years ago. If you're a "Game of Thrones" fan, you should know that 85 percent of the filming of the show is done in Northern Ireland, and Titanic Studios, right behind the Titanic Museum, is where the sound-stage filming is done. If you do stay in Belfast, the Malmaison Belfast Hotel is a chic boutique hotel in an ideal location with a trendy bar, excellent food and genial staff. If you'd rather focus on the golf and the charm of the Northern Irish countryside, the town of Bushmills is an excellent choice, located within 30 minutes of Castlerock, Portstewart Golf Club and Royal Portrush. Yes, that's the place where Bushmills Irish Whiskey is made, and you can visit the distillery and tasting room. Just down the street, you'll find the Bushmills Inn, which I guarantee to be one of the most singular hotels you will ever rest your golf-weary head. The inn is a rabbit warren of sitting rooms, dining rooms, pubs and fireplaces. Each guest room is unique, and the food is spectacular. There's even a secret Scooby Doo-like room behind a bookshelf -- see if you can find it.